Wow. I've actually made something! Well, I've started. But everything starts with a starting right? Its a British BvS 10 Armoured All Terrain Vehicle, comprising an articulated cab and trailer arrangement with both elements providing steering and motive power. I liked the idea of this and had been looking for a way to make my Grymn Mechanised force more modular. 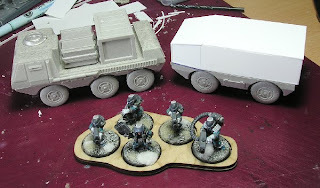 Allowing the same figures to stand in for convoy protection, forward recon, Mobile hospital, mechanics etc. I first mentioned it some time ago towards the bottom of this post. 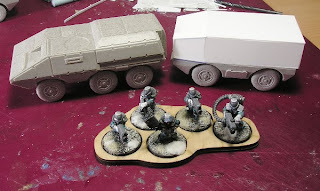 So I bought the lower hull, chassis and wheels of 4 of these Old Crow Scout Outrider Vehicles, and decided to scratchbuild a number of alternate 'Upper Hulls' which could be interchangeable. It may not look like much but this is the initial shape of the trailer I've devised. Its deliberately boxy as I want it to match with the notched plate simplicity of the Old Crow vehicles. This picture is taken before any gap filling and sanding. There will be different sizes and shapes of Upper Hull but I wanted to start out with something straight forwards - I think this hull is going to be a field Ambulance. So that all of the models are interchangeable I have used rare earth magnets to locate the upper hull and chassis structures. I made up a simple jig to locate the holes accurately, and these are just 4mm magnets glued into 4.2mm holes. This may seem like a lot of effort for not much progress, but I am looking to make a number of them and by sorting out the jig and the basic dimensions for the simple box structure it means I can make a number of them quite simply and quickly. I've also been chatting to a couple of people about having the pieces laser cut meaning that I could provide simple conversion kits for others if I come up with something people like. 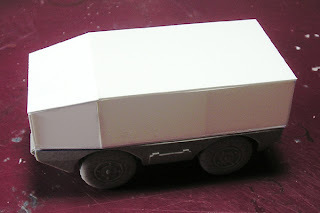 The trailer was going to be pulled by the Trojan Light APC shown below, but it obscures the rear infantry door. So I think the three lightly armoured Provider Transports might be better. Having made this decision I am also going to make some modular elements for the back of the transport to mount on the flatbed area. Again more simple scratch build structures and magnets. Well, they aren't tracked or as short and stumpy as the BvS10 ATV shown at the top of the blog but they will do the job for me. For gaming they probably don't need to be connected as long as the trailer and the cab unit remain close together and one follows the other. However for aesthetic reasons I think I may connect them using some kind of hydraulic piping arrangement again attached with magnets. Well, it's definitely a start. I think that your modular addition to the flatbed of the provider will help to tie things in a bit better too. Thanks Inso, I shall get there eventually... at the moment just trying out shapes and trying to get my ideas straight.